← Happy 128th. Birthday H. P. Lovecraft! The folks over at Fedogan & Bremer, and Composer Graham Plowman, have all approved my request to share the following three complete tracks from our “H. 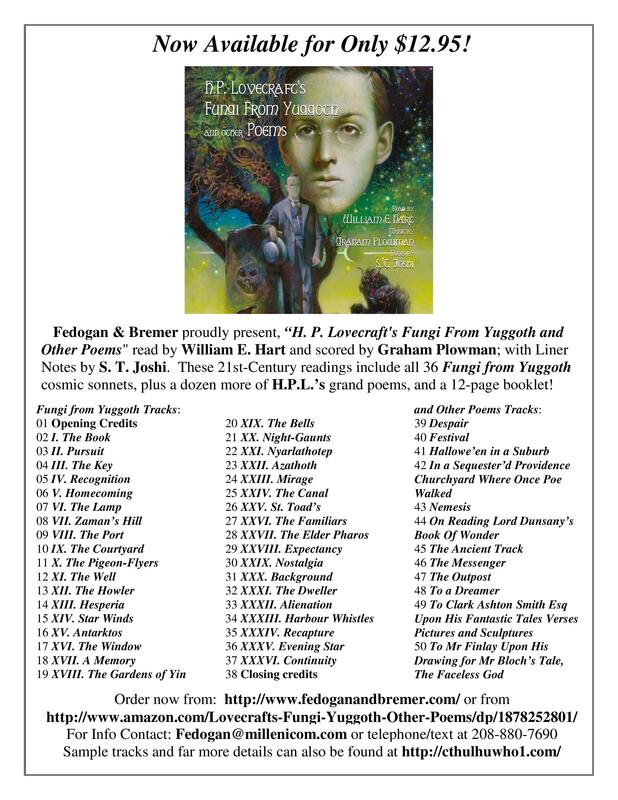 P. Lovecraft’s Fungi From Yuggoth and Other Poems” CD (published by Fedogan & Bremer (2016)), in a visual form on YouTube, so everyone can hear (and read) some full-length examples of what’s on the 48-track CD. Just click on the title cards below, or the links below them, and you will get to hear some of my personal favorites; including “Nemesis,” which I believe will still be a favorite poem and reading for Lovecraftians, long after I am gone from this world. All three of these poems, are given a power and majesty by Graham Plowman’s beautiful scores; as are all of the other 45 tracks on the CD too! Visuals created by Will Hart from Lovecraft’s text using an HPLHS Font. Available on Amazon as MP3 downloads too. And, last, but not least, Credit & Thanks, go to KA Opperman for suggesting that “Nemesis” be included on the CD! This entry was posted in A Memory, Alienation, Amazon, Ancient Track, Antarktos, Audio, Audio Book, Audiobook, Azathoth, Background, Bandcamp, Book, CD, Continuity, Despair, Elder Ones, Evening Star, Expectancy, Fedogan & Bremer, Festival, Fungi from Yuggoth, Garden, Graham Plowman, H. P. Lovecraft Historical Society, Hallowe'en in a Suburb, Howard Philips Lovecraft Memoire, In a Sequester’d Providence Churchyard Where Once Poe Walked, Lovecraft, Lovecraftian, Memory, Messenger, Mirage, Mythos, Nemesis, Night-Gaunts, Nostalgia, Nyarlathotep, Outpost, Poetry, Pursuit, Readings, Recapture, Recognition, Revelation, Score, St. Toad’s, Star Winds, Sunset, The Ancient Track, The Bells, The Book, The Canal, The Courtyard, The Elder Pharos, The Familiars, The Gardens of Yin, The Howler, The Key, The Lamp, The Messenger, The Outpost, The Pigeon-Flyers, The Port, The Well, The Window, To Clark Ashton Smith, To Clark Ashton Smith Esq Upon His Fantastic Tales Verses Pictures and Sculptures, To Mr Finlay Upon His Drawing for Mr Bloch’s Tale, To Virgil Finlay, Where Once Poe Walked, Will Hart, William (Will) Hart, William E. Hart, YouTube, YouTube Updates, Zaman’s Hill and tagged Fedogan & Bremer, Graham Plowman, H. P. Lovecraft, H. P. Lovecraft Historical Society, Hallowe'en in a Suburb, Lovecraft, Nemesis, Poetry, Readings, The Ancient Track, Will Hart, William E. Hart, YouTube. Bookmark the permalink. 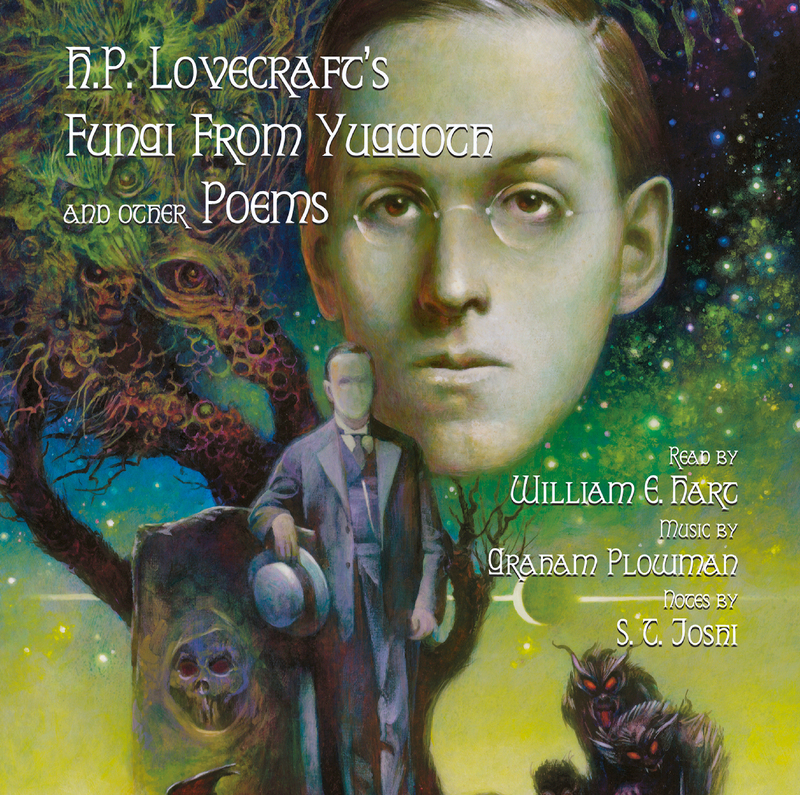 Marvelous CD, a must for fans of H. P. Lovecraft and lovers of weird/horror poetry.